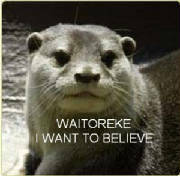 Tales of strange Otter-like creatures have come from the South Island of New Zealand and persist to the present day. what is this strange creature? Is it an undiscovered remnant mammalian species or a stranded and forgotten link to New Zealands past. NEW ZEALAND is believed to have had no mammals when it separated from Gondwana, apart from three species of bats, historical evidence however states that an either otter or beaver like animal may also have been resident here, or been stranded long ago. The first accurate account we receive of this animal comes from the logbook of Captain Cook. When he entered Pickersgill Harbor in 1773 aboard the Resolution, he reports in his journal the sighting of a four-legged, cat sized animal, with short legs and tawny colored fur seen on shore. One of the mariners who also viewed the animals was of the opinion that it had a distinct jackal-like semblance, but with a bushy tail. When Cook queried his naturalists about this beast, which they had not observed themselves, they proposed it may have been some type of fox or more likely one of the vessels cats that had somehow managed to get ashore. Another possibility, of which the Naturalists and indeed Cook may not have been aware of, is what Cook and his crewmen may have witnessed was one of the native dogs (Kuri). This species of dog is now extinct but was described as having shorter legs than the average dog and a very bushy tail. As Natives were residing in the Pickersgill area at the time it may have been one of their dogs Cook viewed, being unfamiliar with the species it is possible Cook misidentified the animal as a new species of mammal native to New Zealand Shores. The Kuri is infact not a native of New Zealand, but arrived with the Maori when colonization commenced. The 1840's brought sightings of a beaver-like creature in the Lake Hawera District of the South Island. This animal apparently built a dam very similar in style to European Beavers. In a letter to his father Walter Mandel, the son of Naturalist Gideon Mandel, reported an animal the natives called a Kaureke, a quadruped that was the size of a cat, short legged and also having a bushy tail. It also apparently laid eggs. This animal was greatly prized by the Natives and kept as pets. Wanting desperately to procure a hide of one of these animals Mandel offered a reward for one of these creatures dead or alive. Regrettably he retained his money as a team of Maori went up into the bush to capture one but returned empty handed. Von Haast wrote to fellow Naturalist Hochstetter in 1862 that he was thoroughly convinced that animals similar to otters were populating the South Island waterways, he had often come across tracks of a web footed mammalian animal along the mud banks of the Ashburton River, however the animal responsible remained elusive. A Christchurch newspaper published another Otter account in 1861 as the animal was pursued by a dog owned by a Captain McMillan. The animal retreated to the water and was lost from sight as it submerged. In 1880 one of these Otters was shot in the Canterbury district and claimed to have been eaten by a local Maori fishing expedition. In 1900 stories started to come in from the Milford Track area of Otter-like animals that were being encountered quite regularly there. Lake Te Anau became a hotspot for sightings as people began to encounter Otters around the lake regularly. Strange reports of an Otter-like animal surfaced in 1939 as some Naturalists in the Waiau area sighted an animal they were unfamiliar with, despite their considerable knowledge of the local fauna. After these encounters sightings trailed off until 1968 when an Otter-like animal was witnessed to leave the Stevenburn Stream near the Whakea River in the Southland District. The animal checked the area as it emerged from the stream, then signaled to three other semi adult individuals which followed her up the bank and disappeared into the undergrowth. 1971 brought another report this time in the Hollyford River area, a hunter heard splashing as he neared the river, waiting for his comrades to collect him by boat, by the river he saw an animal very similar in form to an Otter scaling the river bank and sliding back down again as if playing. He witnessed this performance for about 15 minutes before the animal left. From the accounts we can deduce the New Zealand Otter is smaller than its European counterpart, as some of the witnesses had seen the European species in the wild. 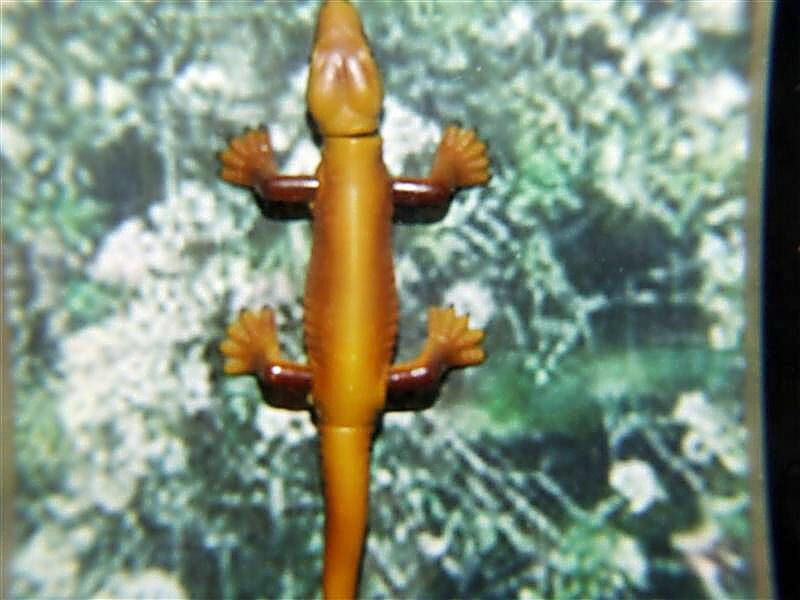 A length of about 100 cm is the largest individual described. Their fur is described as ranging in color from dark brown to sepia, in most instances with a lighter underbelly. Tracks found, including those by Von Haast, often show webbing between the digits, basically similar to those left by the European Otter Lutra lutra. There is however another candidate for the mysterious Waitoreke, the size and description of this animal closely matches that of L. lutra barang an Indonesian species of Otter also known as a “Simung”, the only discrepancy being the color of the fur. This species seems a likely candidate as it is domesticated in Indonesia and employed for fishing. If this is the case it may be a subspecies that has developed due to it isolation in New Zealand. If it is a remnant population, it may well be extinct or nearly so by now. If not extinct already its stronghold appears to be Western Otago and Southland, with low population densities further found in the Canterbury foothills between the Waimakariri and Opuha Rivers, remote areas of southern Nelson, South Westland and the Catlins District of south eastern Otago. However, habitat destruction in these regions would have forced them into unfrequented areas and the principal hope of encountering this species rests in areas that even today remain virtually unexplored in Fiordland, Otago and Southland. How did these Asian Otters get here to start with? It is possible, with the Tamil artifacts found in this country, as in the case of Colenso's Tamil Bell dated to 1500 A.D, and other jade artifacts, and undoubtedly the new Chinese map showing that the Chinese certainly knew of New Zealand and perhaps even visited here before the appearance of the Maori, that the animals may have arrived that way. These Otter-like animals may be descendants of animals stranded here centuries ago, if this is indeed what occurred they would not have been abundant to start with, and if still surviving with the colonization of man they may have relocated further into the remoter areas of the South Island to evade human contact. It further seems plausible that these animals were stranded in the lower region of the South Island as there are no reports of them in the North Island. Greg Stubbings, a man who has carried out a lot of research in this country into the Waitorekes possible existence, recently staged an expedition to the areas of the South Island where the animal had been witnessed in the past, to try and find some evidence of the animals existence. Despite substantial personal investment in trip cameras and other equipment no sign or sighting of the animal was forthcoming. He did however state that many of the regions where the Waitoreke was formerly seen were now extremely urbanized. Until some physical proof of this animal comes to light its existence will always be another enigma in the history of New Zealand. We can only hope that if it does survive it is discovered before it does become too late and the Waitoreke becomes another extinct species we only discern from rumor and speculation.